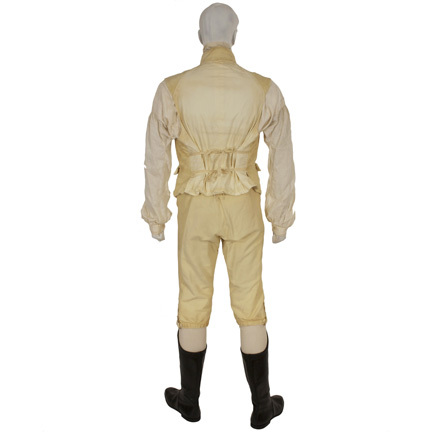 This 1880’s British Naval costume was worn by the character “Capt. 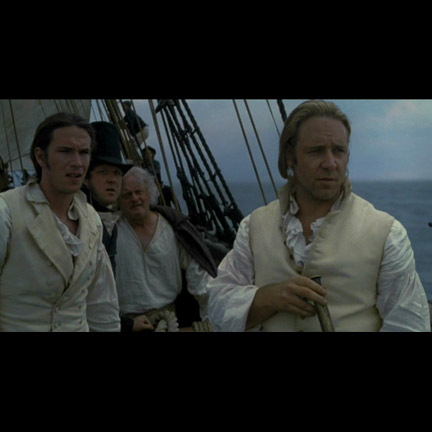 Jack Aubrey” portrayed by actor Russell Crowe in the 2003 motion picture “Master and Commander: The Far Side of the World” directed by Peter Weir. 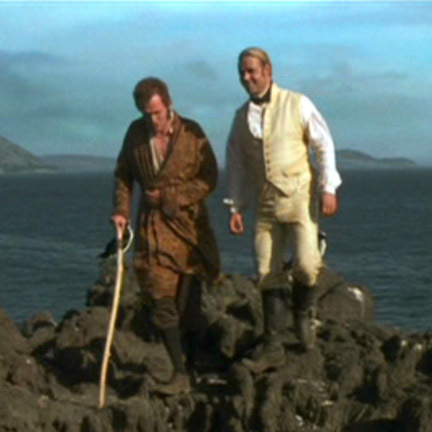 The period outfit consists of a white shirt with full sleeves, cuffs, stand collar with self ruffles down the front and fixed neck cravat, black ascot, button front cream waistcoat with straps at the back, a pair of matching knee length breeches, socks, and a pair of knee high black leather boots which were custom made for Mr. Crowe but not screen used. 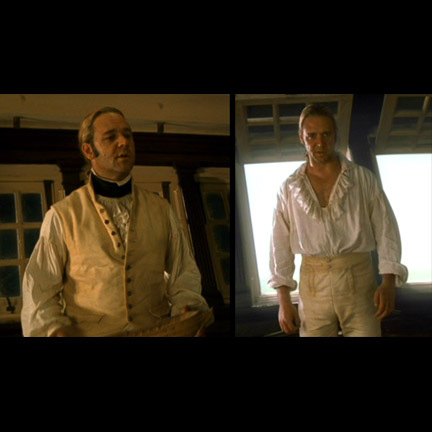 This signature costume change was worn by Mr. Crowe in various combinations in numerous scenes throughout the film, which chronicled the fictitious British sea captain and crew’s difficult pursuit of a formidable French warship during the height of the Napoleonic Wars. 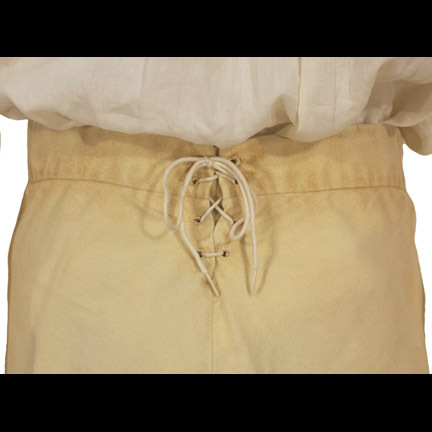 The actor wore the costume with and without his jacket and/or waistcoat and ascot in multiple sequences above and below decks of his ship the “H.M.S. Surprise” as he struggles to chase the “Acheron” through storms and battles around the seas of South America. 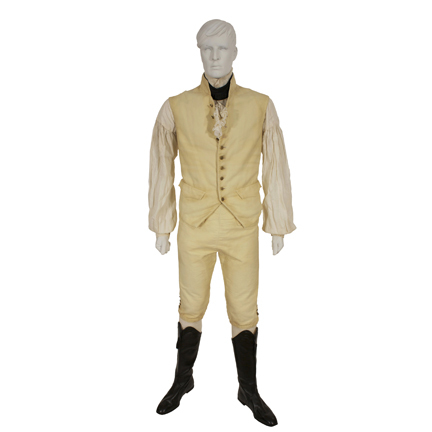 The garments were all custom made for the actor’s use on the production, and the interior of the vest and breeches have the original costumer’s tags sewn inside with the name “Mr. Crowe” handwritten in black ink. 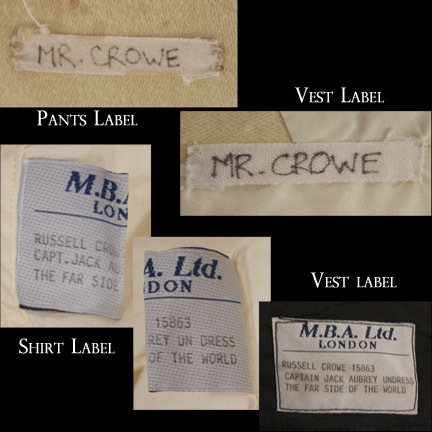 The shirt and tie are both complete with the M.B.A. Ltd. of London tailoring tags reading “Russell Crowe, 15863, Capt. Jack Aubrey undress” and the film’s secondary title “The Far Side of the World”. 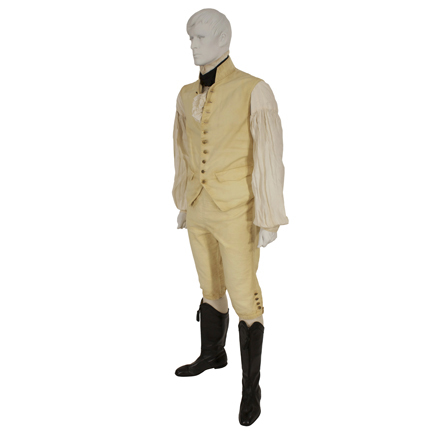 The boots were custom made prototypes of the actual screen used versions worn in the film, and the yellow interiors have “Capitan (sic) Aubrey, Russell Crowe, 44” handwritten in black ink. 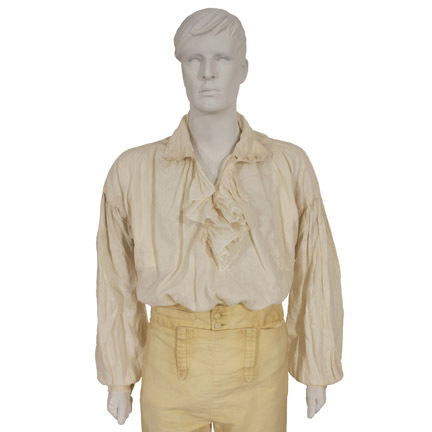 With the exception of the boots, all garments are in good screen worn condition with natural evidence of distress and water staining that occurred during their use in the action sequences involving harsh weather at sea. Accompanied by a letter of authenticity from Mr. Crowe’s personal costumer that worked on the film.